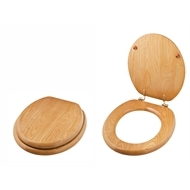 This superior quality timber toilet seat features a solid timber construction, brass hinges, and an attractive honey oak finish, with adjustable fixings between 100-195mm. Attach the circular metal brackets to the 2 metal hinges using the phillips screws provided. When attached check that the 2 circular brackets line up with the preset holes in the toilet bowl. If you should find the brackets do not line up with the holes in the toilet bowl, simply loosen the phillips screws situated in the base of the 2 brackets. You will find the brackets will be totally adjustable and line up with the 2 holes in the toilet bowl. If you require adjustment for the positioning of the seat, use either hole B or C for fixing spindle. Once you have repositioned the brackets, re-tighten the 2 phillips screws and then proceed to lift the seat.